The Application Experience and Compatibility feature ensures compatibility of existing software between different versions of the Windows operating system. The implementation of this feature results in some interesting program execution artifacts that are relevant to Digital Forensic and Incident Response (DFIR). I spent a lot of time talking about these artifacts in my posts: Revealing the RecentFileCache.bcf File, Revealing Program Compatibility Assistant HKCU AppCompatFlags Registry Keys, and Exploring Windows Error Reporting. 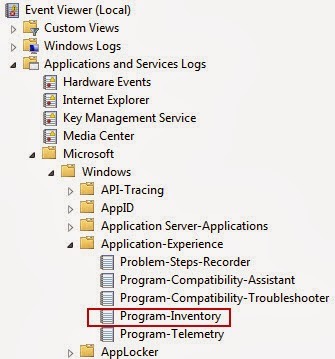 In this short post I'm discussing another source containing program execution information, which is the Application-Experience Program Inventory Event Log. 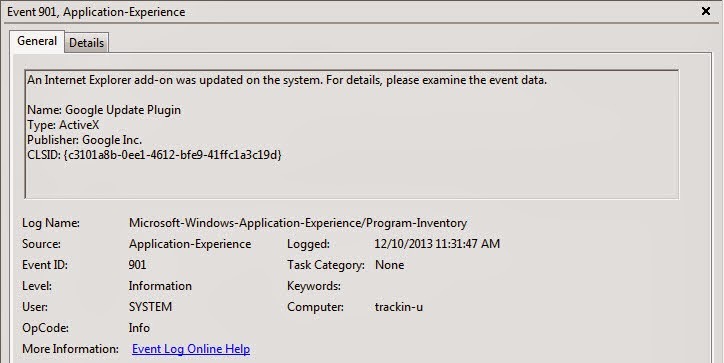 Similar to the other event logs on a Windows system, the program inventory event log (Microsoft-Windows-Application-Experience%4Program-Inventory.evtx) is located in the C:\Windows\System32\winevt\Logs folder as shown below. 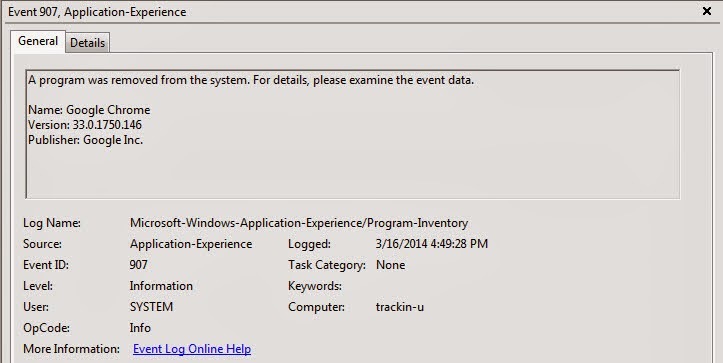 In the Windows event viewer the log can be found at: Applications and Services Logs\Microsoft\Application-Experience\Program-Inventory as shown below. 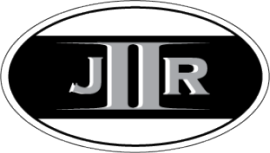 The DFIR relevance of the events recorded in this log has been mentioned by others. The Cylance Blog briefly mentions it in their post Uncommon Event Log Analysis for Incident Response and Forensic Investigations. The NSA document Spotting the Adversary with Windows Event Log Monitoring references the log in the Recommended Events to Collect section (pg 27). The document outlined the following event IDs: 800 (summary of software activities), 903 & 904 (new application installation), 905 & 906 (updated application), and 907 & 908 (removed application). Harlan provides more context on how the events in this log can be useful in his post HowTo: Determine Program Execution. He shared how he used this log to determine an intruder installed a tool on a compromised system. Now let's take a closer look at these event IDs to see what information they contain. Event IDS 907 & 908 (removed application). Great post! I've found this log useful enough to prepend events with "program execution" when parsing the records to be added to a timeline.